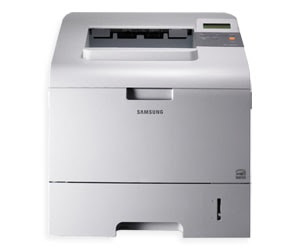 Samsung ML-4055, ML-4055N Monochrome Laser Printers with the performance of compact laser printers that produce high-quality, equipped with several special features that improve print quality with excellent quality. ML-4051N series superior quality printing delivers maximum resolution Up to 1200 x 1200 dpi effective output, produce quality photos or documents clear sharp text and graphics / high-speed printing speed (A4) Up to 38 ppm / Up to 41 ppm in Letter / Duplex (A4) Up to 26 ipm (27 ipm in Letter). Bidirectional Parallel Standard – Modes supported Compatible / Nibble / Byte / ECP, USB Interface Standard (USB 2.0 compliant – 480 Mbps 1 port). Network Interface enthernet 10/100 Base TX wired LAN/802.11b/g wireless LAN (optional) provide maximum add 500-sheet optional tray to the printer/printer paper tray adds less often.